I’m Lora, of Craftivity Designs, and when I’m Creating our Home I focus on function before style. 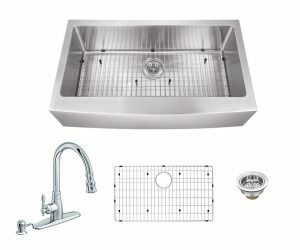 So, before picking out the prettiest sink, determine whether you’d prefer single or double basin for washing dishes, pots, and pans. 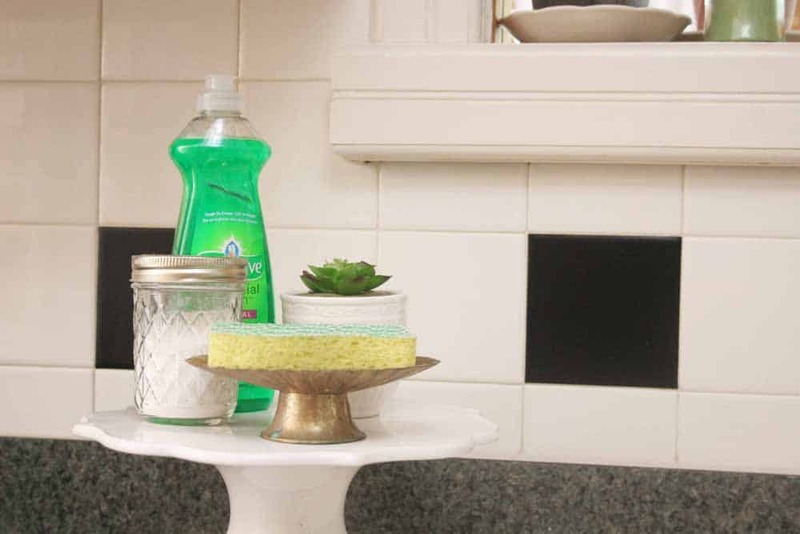 Because, the fact is, most of us spend a lot of time at our kitchen sinks, right? 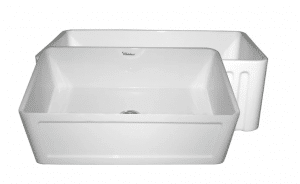 Plus, once you choose single or double basin, you’ve already begun to narrow down the choices. 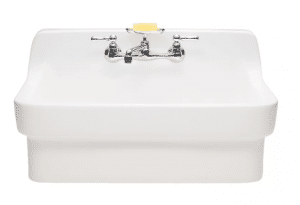 It’s safe — but still timelessly farmhouse — to choose a clean and classic white farmhouse sink (just like Joanna Gaines chose for the Carriage House). 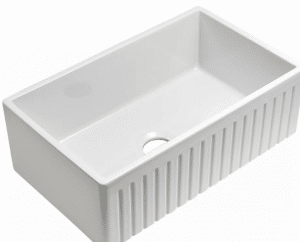 A white apron sink will work well with white, wood, or painted cabinetry. If white feels just a bit too basic, try a fluted-style farmhouse sink for a bit more detail and interest (this formal kitchen is a great example). I know many people are unabashedly stainless steel fans. Stainless steel pots and pans. Stainless steel appliances. Stainless steel kitchen utensils. 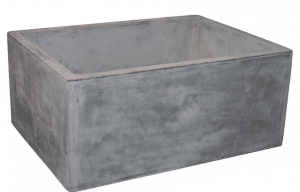 The list goes on… If that describes you, consider a farmhouse style apron sink with a stainless finish. A stainless steel sink can also be used to add a modern touch in a farmhouse kitchen (like the sink in this Historic New Jersey Home). 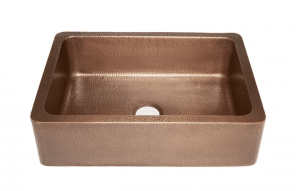 If stainless feels too cold or industrial, but you prefer a metal sink, consider copper. 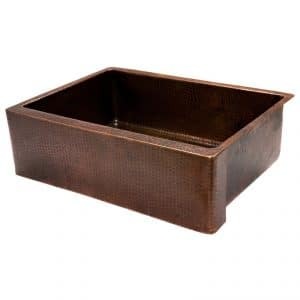 A hammered copper farmhouse sink is a beautiful statement piece in a kitchen. It will add warmth and texture to the room due to the color and material of copper (I love how it pops against the black shaker cabinetry in this Kitchen by Camilla Banks). 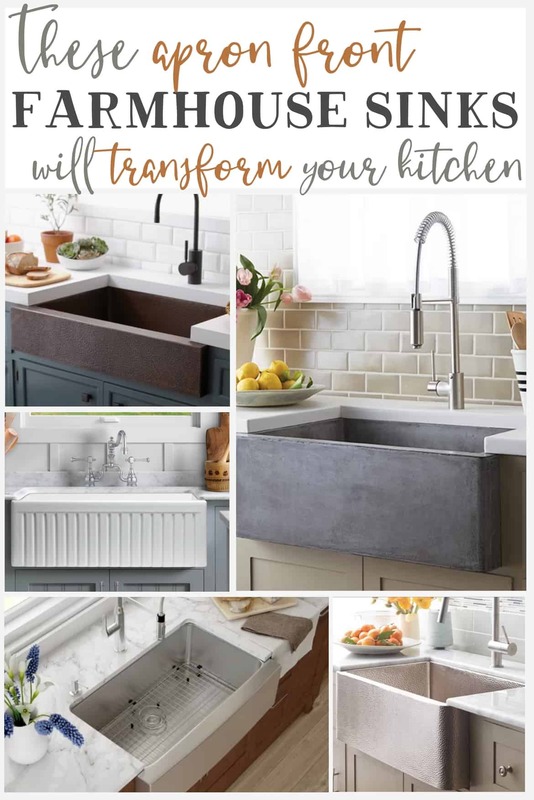 To really amp up the texture in your kitchen, choose a stone apron sink. A stone farmhouse sink, like this one in a bright Seattle Kitchen, will lend a nod to rustic style. 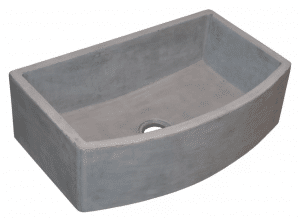 If you like rustic elements, the stone apron sink should definitely be something to consider for a kicthen reno. 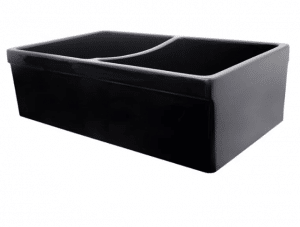 Finally, the last — and slightly unusual choice — is a black sink. 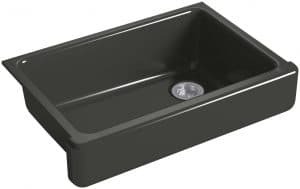 I’ve seen black farmhouse sinks popping up more and more often, as of late. It seems to be a trendy choice to inject a bit of high contrast and modern style into a kitchen. I love a black sink in a kitchen with classic white cabinetry (like this Land Park CA Remodel) as an edgy, unexpected touch. 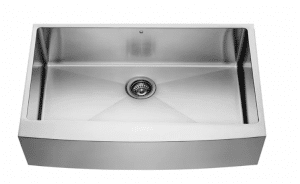 So, which farmhouse sink would you choose, and why? 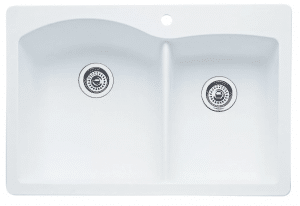 While you’re commenting, let me know whether you prefer single or double basin. 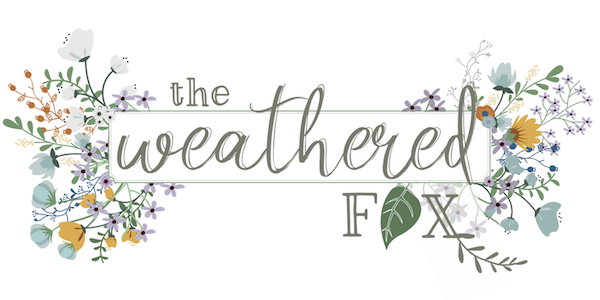 I’d love to hear your thoughts as I may have a kitchen reno on the horizon, too! Would you like to see more kitchen and bath ideas? 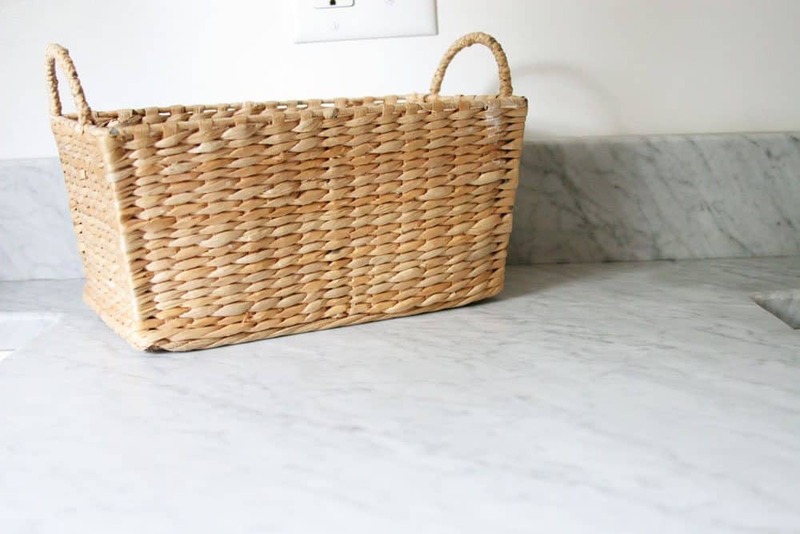 Check out my 1-Year Review of Marble Countertops, 50+ Subway Tile Ideas, and Simple Tips to Organize around the Kitchen Sink.